Woman in Heels | Crockett Foundation - Tag In & Help Out! Frances Crockett Ringley had a lot of things she had to learn and adjust to as she broke baseball’s glass ceiling. Being the first woman general manager of a professional baseball team, was definitely something you learned through on the job training. There is no book that tells you how many hot dogs a baseball crowd can eat. No one around has ever designed a baseball logo which gives a nod to the Baltimore Orioles but makes the O’s Charlotte’s own. Then there were the players, how many are on a AA baseball team? She has to learn to get the team to away games and find hotels in those cities that would accommodate a large group of young men. While going through her learning curve, she also had to determine what constituted a rain out vs a rain delay. Frances, of course, would confer with the umpires and managers but she had to come up with her own way to give her opinion. Remember this was a long time ago before the advent of cell phones. Everyone in the ballpark is an amateur meteorologist glued to their cell phone watching the radar screen as rain approaches these days. Frances did not have the luxury of a cell phone with a weather app. Oh no, Frances had her high heels. Yes. Her heels. After a couple of trips to the field to talk the rain talk and walk the rain walk, she soon realized that the condition of the infield and the effect of a passing storm coincided directly with how far down in the dirt her heels would go. It was no easy task to walk out on that baseball field in a skirt and high heels but by God Frances did it. Cutting through the home dug out she would make her way out to third base to start the deliberation between herself, manager and umpire. Frances would be seen nodding as they talked rain and mud. Ultimately as she strolled across the field it was the depth she sank while walking that sealed the deal for her. As the crowd and players watched, Frances Crockett Ringley did rain her way. 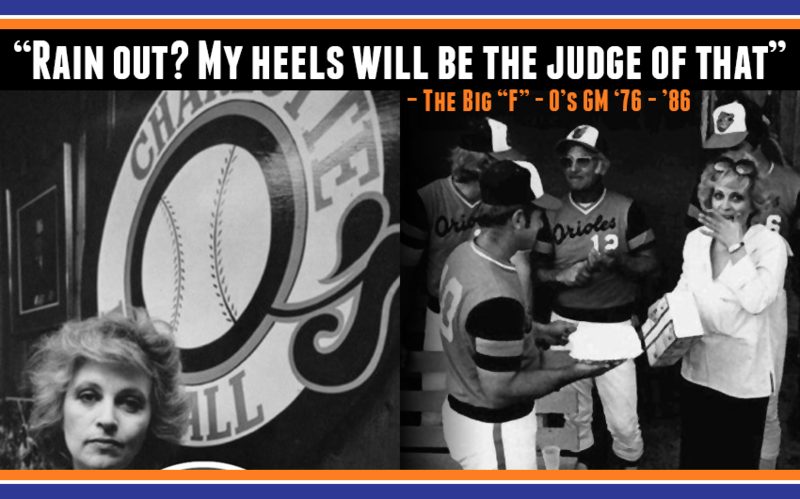 Some of the former players that attended a recent O’s reunion at BB&T Ballpark in Charlotte, NC, mentioned that they have never forgotten the first time they saw this ritual and have wished many times that they could find a pair of heels like the pair Frances wore. They want to have them bronzed and sent to her so she would always know how vividly they remember her unusual way of handling rain at a ballpark. This practice is even memorialized on a brick at BB&T Ballpark in Charlotte, NC. Now everyone will know the story when they pass it on their way into a Charlotte Knights game.